Monday, June 9. Since Ben and Jill had to meet the movers this morning (scheduled between 10 and 1 but they didn't show up until 2:00), Connie and I had kid duty all day. We even packed the twins into the stroller and walked the coastal trail until the pavement ended, a good walk with beautiful views of the coast. The 'last time I'll experience' thoughts keep coming to mind as my stay here is winding down. We did well until about 4:00 after Charlotte did not nap and was into everything, Norah had a fever and was not feeling well, and it was getting close to dinner time. Jill came over and relieved us for a while and checked on Norah, but had to go back to the apartment for final preps. The movers finished their job and left at 8:00. We survived the very busy day and had a quiet moment to eat a salad that I picked up from the restaurant. I felt bad for Ben and Jill when they didn't get back home until 9 and still had to organize some stuff. Tuesday, June 10, SF to Reno, NV. My family was up and out the door by 7:00 this morning, heading out in an airport shuttle with themselves, 3 car seats, 5 large suitcases, and 3 backpacks. Jill's cold is better, Ben's is worse, and little Norah started to be sick and had a fever. I sure hope that their trip isn't too miserable. I went to pick up Ruby from the dog sitter and my stuff from the apartment and then Connie and I had a nice breakfast. We then set out to do some sight seeing around SF, since it had been a long time since Connie was there. Our first stop was to see Lombard Street and I managed to take a few wrong turns and go the long way, we made it and enjoyed it. We then headed to pick Frisco up at Pet Camp - I also took a wrong turn and barely made it there in time to avoid being charged an additional day. Golden Gate Park was next on the list before we drove along Ocean Beach and then we headed out of town north, crossing the Golden Gate Bridge. The destination for day one was Reno, NV and we got there without problems. The dogs were good, sleeping most of the time. Wednesday, June 11, Reno, NV to Salt Lake City, UT. Day 2 was uneventful and a full day of driving, basically from La Quinta to La Quinta, with stops for food, coffee, and potty breaks. The power plug for my GPS broke and I have been unable to find a replacement - checked at several truck stops, bought one, but it wouldn't stay on so I took it back. I then went to Plan B and bought a mounting bracket for my iphone and used the Motion X GPS App. It works great and is accurate. Have I ever said how much I love my iPhone? Before going to our motel in Salt Lake City, we drove to Park City so we could see what it's like. It is a beautiful town that reminded me a lot of the Swiss Alps. No wonder all of the rich people like it there. 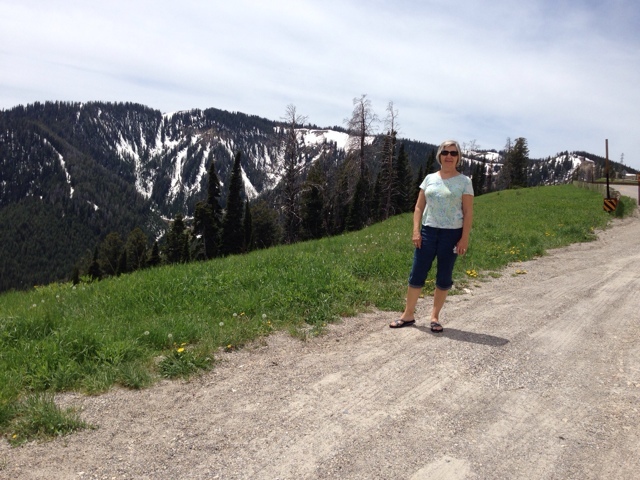 Thursday, June 12, Salt Lake City, UT to Bozeman, MT. What a gorgeous drive we had today. We headed north out of Salt Lake City, then cut east to Jackson Hole, WY and it is just that - a hole (a valley that is between mountain ranges). A stop along the way was necessary because of the snow that remains on the ground in the higher elevations. I didn't feel the need to touch it but I did take a photo. 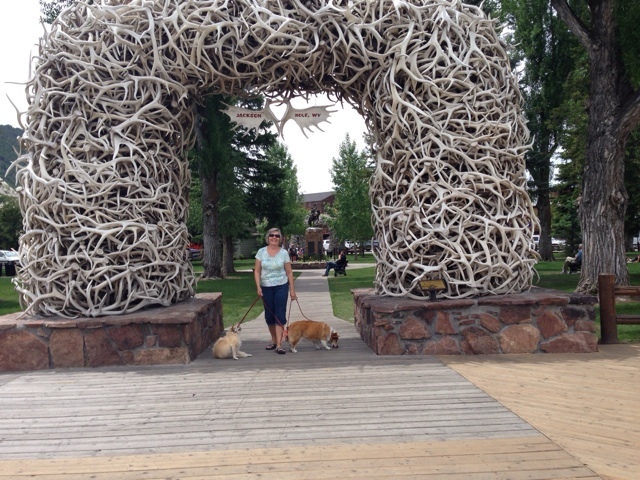 The town square was so cute, we just had to park the car and walk around it, stopping to take photos at the elk antler arches on each corner of the beautiful little park. Before leaving, we stopped at the Brooklyn deli to grab sandwiches for a picnic lunch in Yellowstone National Park. The drive north took us through Grand Teton National Park - what majestic views, surrounded by gorgeous mountains and fast moving waterways. 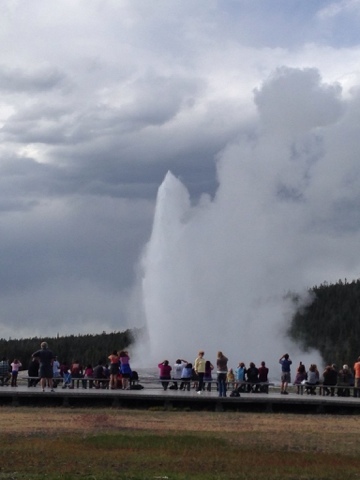 There were many places to stop and see sights along the way but it was going to be a full day and we didn't expect to reach our destination until 9 or 10 pm, so we only stopped for lunch on the top of a mountain at a spot overlooking a lake and at Old Faithful. I was unable to walk the boardwalk, because of the dogs, so I stayed back and Connie wandered around and sat up close to see the eruption. We did get to see some wildlife along the way - buffalo, elk, deer, antelope, and prairie dogs and we pulled over where people were standing with their cameras and learned from a little boy that they were watching a bear and a wolf. The bear had been in the road and hit his daddy's car, then went into the woods and down a hill, so we weren't able to see it. 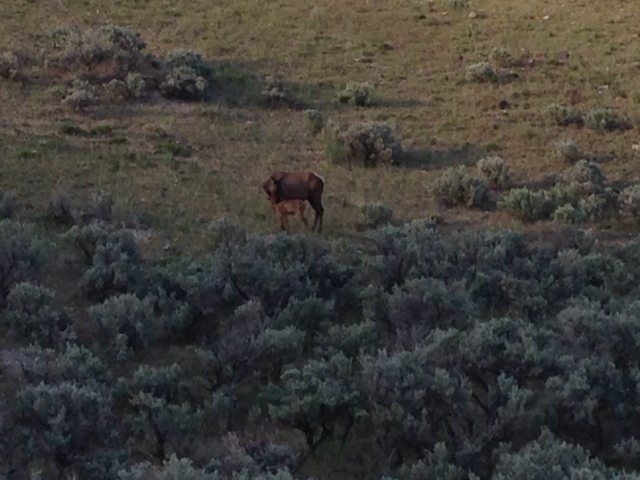 The best reward was as we were leaving the park and spotted a Momma Elk and her baby nursing. Here's the photo but it's not the greatest. By the time we got out of the park, it was another 30 mile drive to our motel near Bozeman. At that point, it was 9:30 and we were exhausted - Connie had to drive through road construction in the dark. We stopped at a grocery store for something light to eat and were happy to see our motel and ready for a good nights sleep. Friday, June 13, Bozeman, MT to Rapid City, SD. Once again, the sights along the way were beautiful. At one point, in Wyoming, we were surprised when we were pelted by hail that lasted for a good 5 minutes. I haven't seen any of that stuff in a long, long time. We did have a bit of rain during the later part of the drive. 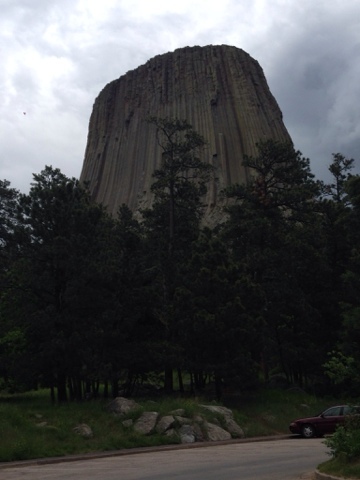 Outside of Gillette, we took a detour to see the Devil's Tower. I was unable to take the trail around the monument because of the dogs but I got good views from the parking lot and remembered it from a family trip back in 1982 - can you believe it looks the same? We got checked into our motel, only to learn that the WIFI doesn't work with Apple products - Grrrrrrrr! I don't like being disconnected. We walked a short distance to the Colonial House Restaurant and Bar for a delicious dinner and a cocktail. Another good day on this road trip. Saturday, June 14, Rapid City, Deadwood, Sturgis, SD. We heard thunder, saw lightening, and had pouring rain throughout the night and the threat was for rain most of the day, but some clearing in the middle of the day. Lucky for us, it turned out to be clear when eye got to Mt. Rushmore, although there was a cold wind blowing. The cost to park a car for a while is a bit high - $11.00, so we passed our parking tag off to another couple that were going there the next day. From there, we headed along the Spearfish Canyon Byway to Deadwood, parked the car and wandered the streets. We stopped at Kevin Costner's Diamond Lil restaurant for a delicious lunch and a beer. Again, we lucked out and had rain only while we were eating our lunch. On to Sturgis, we only stopped at an antique shop to browse around and had an interesting conversation with the owner. She really disliked the town ( the locals are great but the rally people, those who have all of the money, were awful. She was only planning to keep her shop open a while longer before getting away from there. Sunday, June 15, Rapid City, SD to Minneapolis, MN. Although I made a reservation for an overnight stay in Mitchell, SD, we headed straight on to Ben's house. It was a long, eleven hour day but it did include a couple of sight seeing stops along the way. Our first was to take a quick stroll through Wall Drug. You just can't go by that town without stopping. It seems like nothing has changed since 1982 when I was there last. Our next detour was through the Badlands and we made some stops at some of the lookout areas. I always feel like I'm in a strange movie set when I see that strange landscape. It is beautiful and incredible. The other sight that we just couldn't pass up was the Corn Palace in Mitchell. It was a bit disappointing, as it was under construction, so only one of the outside walls was decorated. We could still check it off the list. And then we pushed on to find Ben and Jill's new house. I had entered the address in the GPS as North instead of South and we went about 10 miles out of our way. We finally made it and I am so happy that they got such a nice house and neighborhood to live in. Yes, there is work to be done but the results will be rewarding in the years to come. We will be sticking around here until Friday evening when Connie will fly back to Mesa and I will head to Tomahawk on Saturday morning to get my little trailer. I am so excited!